Electrical frequency compensation circuit response effects simulated in Microcap software. What is immediately apparent is that the choice of lf/mf crossover frequency f-3db's (both less than 850hz) are almost symmetrical.. for the Monitor RED's electrical crossover response (in graph #1) which are the two red traces. (the difference in hf response between the red/gold xover is obvious, with Red proponents claiming a 'better' hf response as a result of the depicted response for the earlier driver). 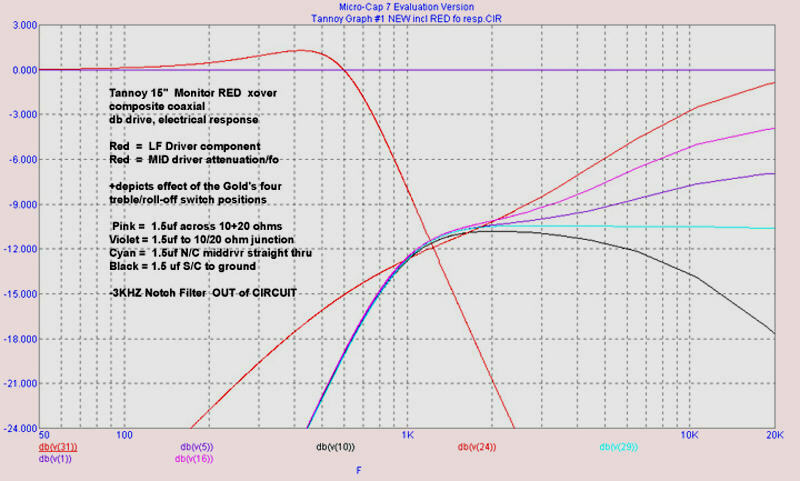 The Monitor RED does not use an inductor for the highpass section, only a simple r/c pad and capacitor sets the attenuation/sensitivity/preemphasis and hp filter function..... this is approximately matching the attenuation level referenced for the Monitor Gold's 12db/octave l/c/r hp filter. The fixed 'rising with frequency' electrical drive response from the crossover is necessary to achieve a reasonably smooth Acoustic response, in fact for both the RED and GOLD mid/hf drivers....and is not at all unlike the r/c pad corrections necessary for the most modern implementations of Biradial, cd, and Waveguide horns. 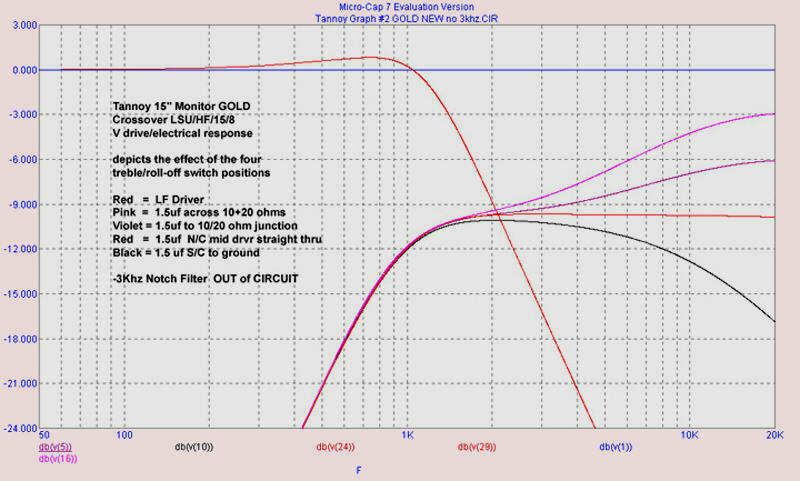 Accordingly, Tannoy have named the Gold's (mainly variable boost) switch 'Treble Roll-off', although one can plainly see that the switch function (electronically) is to provide varying and lesser degrees of mid/hf boost, for two of the switch positions, with one being flat/straight through (1.5uf o/c)..... only the last switch position giving an electrical Treble Roll-off characteristic, in fact. As well, the graphs were made using pure resistance instead of the actual driver impedance models, which impedance models only serve to make the hf response look 'worse'...as in a little more exaggerated. It can be seen that the Monitor GOLD in graph #2 uses an overlapping electrical (Assymetrical) response to achieve best summation at the acoustical crossover point, and has quite similar hf sensitivity to the earlier driver (the driver electrical responses, for lf f-3db is about 1,5khz and the hf f-3db is about 880hz, result in Tannoy stating the acoustic crossover result to be 1khz). is as #2 but includes additionally the effect of the 3khz filter, implemented straight with notch depth reduction due to the 0.82mh inductor's internal resistance of about 11ohms. What is not shown is the additional acoustic output which results from coincident f-3db acoustic summation . -the electrical overlap necesary for the drivers which results in this for the Tannoy driver's must be kept in mind when duplicating the curves with an active crossover. It must always be remembered that it is the electrical drive depicted (not the acoustical response) by the curves shown. Smooth acoustic response results from the gently sloping natural rolloff of the early Tannoy DC midfrequency unit's, the increase in db/spl at the acoustic summation point and the 3khz resonance filter notching, together with the difference in lf/mid driver sensitvity which is indicated by the graphs as well. This is not unlike the high frequency coreection necessary to achieve the same thing in a modern cd, biradial, or waveguide horn, but for different reasons, and with different results.. in that the modern horns exhibit a uniform power response, rather than mainly axial performance of the exponential/tractrix types. The graph colour codes are corresponding to the treble rolloff switch wiring colours depicted on the 1967 Gold's crossover listed for years already on Hans' website http://www.hilberink.nl/speaker1.htm . However, there are examples of different colour assignments for the Treble rolloff switch given on other sites. Quite the opposite situation is happening for the so-called Treble 'Energy' (shelving) switch positions, where wiring colour is uniform, but with different inductance values being assigned to the same colour. (the 'Green' wire is 3mh on some crossovers, while on others it is 4mh). To avoid confusion as to the expected f-3db point resulting from the different values of the tapping, it is correct to describe this tap wrt it's function (highpass filter winding section of the Autotransformer). There has been past discussion, going back years, concerning the alledged "Mystery 50 ohm" resistor. It's function is damping trim, enabling adjustment of the nominal 12db/octave slopes to more closely approximate the ideal Butterworth characteristic slope, given expected production variation wrt the theoretical guestimations of coupling coefficients in the practical autotransformers, which 50 ohm resistor is in parallel with an existing 45 ohms across the autotransformer represented by the10ohm+20ohm+ driver impedance. (one of the Autograph xover's uses 100 ohms for eg). The 50 ohm damping resistor is more optimised for the Values corresponding to the Yellow tap on the 1967 crossover circuit, and is a compromise wrt to other tap values otherwise used in switching different midriver shelving levels. (termed 'treble energy' taps by tannoy). Even though the total inductance values of the taps are quite close (for the 3mh green+1.2m yellow...... vs 4mh+0.5mh for the 1967 circuit on Hans' Tannoy site http://www.hilberink.nl/speaker1.htm ), the mutual inductances corrsponding are quite different. Note that the 50 ohm is not switched across the highest impedance tap (red wire)... the 10 ohm and 20 ohm series resistors with the mid driver impedance across this tap provides more than adequate damping, alone. As well as affecting the slope, altering the value of the "50ohm" resistor necessarily affects the attenuation of the mid/hf driver, which is also quite audible. The beauty of an active crossover is that these circuit operations are isolated from each other by unity gain buffers, so that changing one will not alter (confusingly) the other parameters at the same time. . The value of the 50 ohm resistor was optimised to 56 ohms by constructiing an 12db/oct butterworth active filter in parallel with the passive filter in the simulator and simply superimposing the two output graphs, while stepping the value. The value was selected for the passive slope to match that of the idealised Butterworth for one of the Autotransformer/inductance models. *If the values are those values depicted on the 1967 crossover (on Hans' site, see above link), for the k values guesstimated for the ideal Autotransformer modelled, for eg. But if the inductance is 3mh, wirh the yellow tap at +1.2mh a 37 ohm value is pretty well smack on, slope wise, for the optimised 'k' values used for THAT autotransformer model....but with of course increased attenuation around the 1khz point for the mid driver alone, Otherwise this quite definitely overdamps the response. 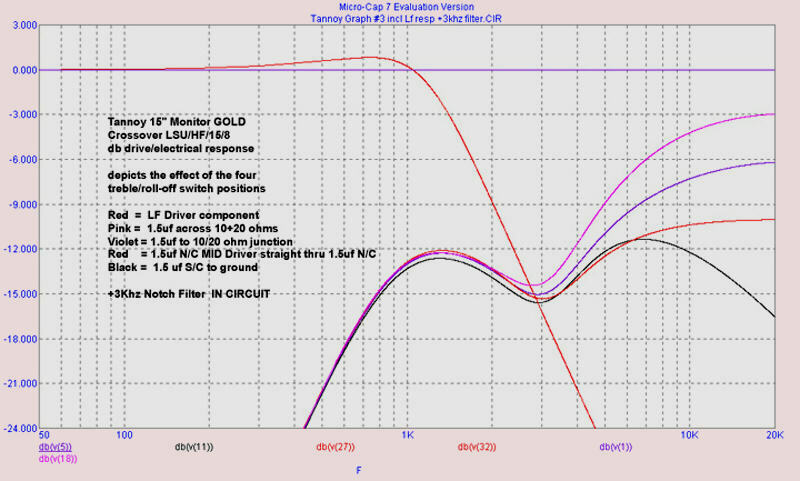 The 3khz filter is a simple L/C/R series trap (3.3uf+0.82mh) directly across the middriver voice coil. The Q or sharpness of the notch is dictated by the internal winding resistance of the 0.82mh coil (820uh = 0.82mh) of approximately 11 ohms, subsequent DC drivers used an additional amount of series resistance to reduce the depth of the notch, and some owners have made this an adjustable 50ohm pot. Note that if one is running the middriver directly from an amplifier, in using an active crosover, there will have to be some additional resistance introduced in series with the trap/mid driver, or this type of filter cannot work as intended. (about 10 ohms is sufficient). To duplicate a given original autotransformer, one has to first determine the value of the tap the 6.8uf capacitor is connected to... and then that of the corresponding tap above this which gives the desired attenuation. As well, one has to use the same core material and former, and wind the same dia wire/coil in the same spacing, sections and layers as the original, in order to achieve the same mutual inductance and coupling and leakage inductance and wibnding capacitance between the taps to achieve the same sound, all of which affects it as does the characteristics of the core. Normal production variation in the practical crossover components, and the idealisation of some parts in the computer conspire to mean that any given xover may not measure the same as any other xover. Even individual drivers from the same run's can sound slightly different, too. For active crossover users, it would be pertinent to make, and include at line level in the preceding the power amplifier, a high impedance version of the frequency correction circuitry which the crossover uses after the auto transformer, when using active crossovers the corrections needed by the drivers are the same regardless of crossover type. To run the correction at line level, it is usually only necessary to make the 10 ohm + 20 ohm R's into a higher impedance 10k + 20k and the cap value to 1,5nf (1500pf or .0015uf allee same) where the volume pot following is 15k in value, for example. this maintains the same time constant for the r/c values and so the same frequency corrections as Tannoy spec'd their passive crossover for. Depending on the frequency range warbled or averaged, it would appear that the Red/Gold composite coaxials have very similar sensitivities, actually....... even the series resistor of 30 ohms is the same (10ohm+20ohm) and for both reducing the sensitivity of the 15 ohm common impedance mid driver down to exactly the same levels, with the only difference here is that the Red's fixed hf boost is resulting from a 2uf rather than 1.5 uf cap in parallel, so ends up with proportionally higher hf boost than the Gold at the frequency extreme above 10khz. It is indeed an expensive, and sometimes fruitless exercise to buy components on a what if basis, and on the other hand it has been argued that mere mortals cannot justify outlaying $7,000 for a circuit simulator to readily graph the results without a chart recorder, scope or soldering iron in sight. However, microsim have released a student version of the software, FREE, which will do everything "crossover-wise" valve and ss, and even some full SET amps, as it handles up to 50 passive/3 active components. Here is a nifty paper explaining transformer simulation techniques necessary to work with these mutual inductance/coupling coefficient (k) issues in PSpice, another very expensive simulator. The model i use in Pspice (and in Microcap allee same) is quite similar to the last one listed in the paper above as example 8. Microcap's pdf, and current student version is downloadable free here. However the beauty of the latest version of Microcap 7.2.4, (even in the Freebie student version) is that all one needs to do is define the Autotransformer model for the inductances (for example 4mh plus 0.5mh) and dial in any coupling coefficient between -0.99 and 0.99. © Copyrights Hans Hilberink & John Ridley, last update: 04-02-2004-Vc.